Thanks for looking into my contest. I'm searching for someone who can design a flyer for a start-up company. The company called HEOO and their selling bar carts. They have arranged that they can put some flyers of their company at an event. The mission of the flyer is to get the attention of the people to come to their website and order a bar cart. - the flyer needs to have a foto of one of the bar cart i put in the attachment. - the flyer needs to have the logo of HEOO, see attachment. 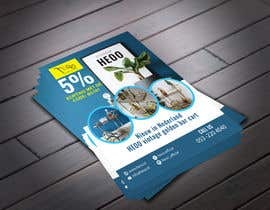 - Flyers needs to have a professional look, they have the luck they can put it on an very good event. * if you think it suits the flyer you can put in on the flyer. I hope someone can come with a nice result, and if you think their has to be some extra information on the flyer, please don't hesitate to ask for information. Hope someone can help this company out and get their start-up going well. Sir,please check #25 & #36 . If you want any change fell free to nock me..Iam wait for your feedback. Sir,please check #25 . If you want any change fell free to nock me..Iam wait for your feedback..
Sir,please check #28 . If you want any change fell free to nock me.Iam wait for your feedback. Sir,please check #19 . If you want any change fell free to nock me..Iam wait for your feedback. I can not open the attached file bule/plant/rose. sorry?